Earn $14.49 in VIP credit (1449 points)What's This? The Ortlieb Trunk Bag RC has a Velcro roll-closure top for storage that is as versatile as it is waterproof. 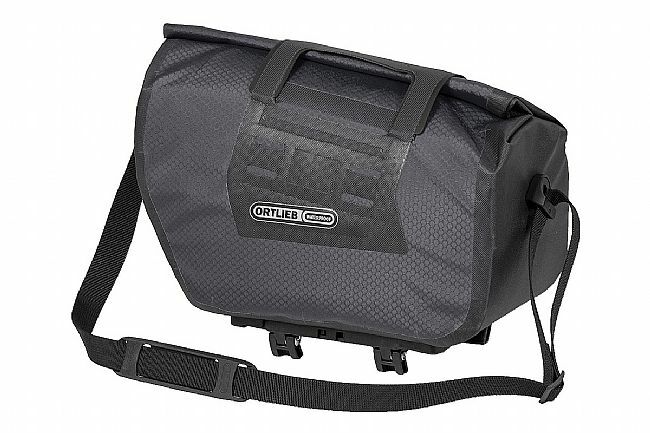 With a hand-carry strap, shoulder strap, and Ortlieb's award winning Rack-Lock mounting system, this bag is ready to go whether it's on a rear rack or on the body. Polyurethane-coated nylon keeps contents dry in a downpour, but a non-waterproof external pocket provides quick access to essential goods. My wife and I each had older trunks that were attached with velcro. No matter how we tried they were never attached securely. The Ortlieb Trunk Bag RC snapped right on without adjusting (YMMV) and it doesn't move at all. The bag is large with enough room for my tools, tubes, small pump, and extra jacket with room to spare. This has allowed me to move all of the non-essential items from my front bag into this trunk and there is still room! The one thing I still need to test is how well it works with the Ortlieb Rack-Pack. Large but closure needs work. This bag is really big. The mounting system is very secure. The one real weakness, though, is the closure system. One flap with velcro is to hold down the roll top, and it comes loose constantly, especially if it's full and you hit bumps. There just isn't enough velcro, or maybe it needs a supplemental strap with some kind of hook or clasp. I deal with it by running a strap around the entire bag, but for this price you shouldn't have to. Love this bag. Just the right size for daily commuting, carrying lunch, bike tool and other crap, with room for a change of clothes or a small grocery trip. This bag sits on my rack nearly 100% of the time now, replacing the single pannier I usually had mounted for commuting. The bag strikes a good balance between weight and strength - it uses a lighter grade of material than Ortlieb panniers, but it's still waterproof, and the thin plastic insert provides sufficient rigidity. It was a little fiddly getting it on my rack - my Pletscher Rack (not recommended) has rectangular shaped metal. I needed to remove the rubber shims on the clamps, and it's totally solid now. The locking feature is nice, but I wouldn't rely on it in unsafe areas. I actually don't love the roll top, or maybe the velcro strap needs to be a little longer. It can be challenging to get it closed when filled to an apparently reasonable degree. I would have liked a buckle. I really wanted to love this trunk. 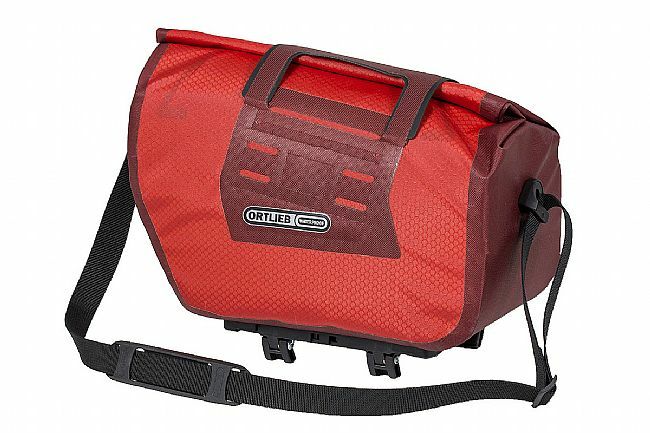 I am a big fan of Ortlieb products, and as a four-season commuter as well as a short-term commuter, I was eager to add a waterproof trunk bag to my collection for use not only while touring but also on my daily commutes. On the positive side, I will say that this bag did in fact prove to be waterproof, despite the fact that the roll-top is held in place only by a center hook-and-loop (Velcro) closure, as opposed to having buckles to fold over and secure the ends. Also, despite the bag's relatively diminutive size, the interior feels quite cavernous, probably due to the minimal structural reinforcements in its lightweight construction. But this then leads to what I consider to be the bag's primary weakness it is too lightweight. At one point during my last tour, I heard something behind me as I pedaled through a construction zone, and I turned to see this trunk bouncing down the road. Picking it up, I figured that I had not adjusted the award-winning attachment system properly, and went about moving the hooks in a little tighter. Problem was, once I did this, it became noticeably more difficult to attach the bag to the rack. Because the bag lacks a rigid structure, pushing down on top of it did not easily cause the quick-release hooks to close around the tubing on my rear rack. Instead, I had to reach under the bag and force the two attachment hooks-one at a time-to close. Over the past couple of months, I have tried repeatedly to find that happy medium between having the attachment hooks moved close enough together to hold the bag securely on the rack, and yet still far enough apart that the bag is easy to attach and remove. I just can't find it. And I have tried two different rear racks. One other example of this bag being a little too lightweight for my taste is the material used for the bag itself. Rather than the more robust material of most of Ortlieb's panniers, this trunk is made with the thinner material found in their smaller saddle bags. That single fall my bag experienced last month did noticable damage, causing a small hole to form. 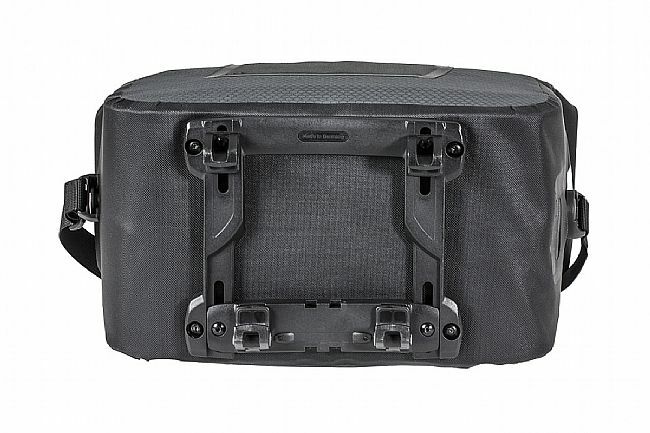 So again, I generally love and have gotten much use out of Ortlieb products, but I find this trunk to be too lightweight for long-term touring use. And even just as a daily commuting bag, while I appreciate the fact that I don't need to worry about my clothes getting wet in a downpour, the inability to find that sweet spot in the attachment system that would ensure the bag won't bounce off, but still is quick and easy to use, has led me to switch back to my old trunk.